Do you have enough storage for a Gun Safe? If not, then you are at the right address. One of the most outstanding common features all-in wall gun safes have is the fact that they are better hidden from a possible burglar than any other kind of safe. As the name suggests, a wall safe is built into the wall. In-wall safes cannot easily be seen by a burglar unless they know what they are looking for. For even more discretion, you can hire an interior decorator to make your safe look exactly like the wall it is built into. They are also much bigger than other safes, catering to the issue of space as one of the many things to things to think about when you consider investing in a gun safe. For the best user experience, you’ll want to choose a wall safe you can access (unlock) as quickly as possible without compromising your safety and the intended security offered by the safe. Common sense should always be exercised with regards to the location of your safe. This particularly applies to any manner in which you might seek to conceal your safe. In practical situations, you might need immediate access to the contents of your wall safe, so you should never obscure your passage into the safe with items such as massive paintings, something which still remains a common practice. Top-quality, properly-fitted wall safes are designed to be waterproof by default. When you have the structure for your safe built, make sure the contractors build the structure a few feet off of the floor. This will ensure you that the contents will be protected from water damage. Kids are curious by nature and any closed-off container like a gun safe will attract their attention. Use your discretion to exercise some caution with regards to children and their surprisingly efficient ability to find their way into your safe. They can memorize the access code if a safe has a keypad and they see you enter it enough. There have also been occasions where kids lifted a safe a few feet off the floor and upon dropping it, caused it to open as a result of it simply hitting the hard surface of the floor. Kids have entered safes and ended up hurting themselves or other people with guns that were locked inside, so be vigilant and never underestimate their ability to access your safe. The Protex wall safe comes with an electronic locking system. The safe’s motorized locking bolt will open automatically when you punch in the security code, and you won’t have to do anything but pull. The comes with two removable shelves, so you will be able to keep your firearms, ammunition, and gear organized. The safe has a high-quality velvet interior that will protect your guns from scratches. The safe’s electronic digital keypad is flush with the door, and it won’t take up any extra space. This safe model is easy to install, and you could do it yourself if you’re used to doing DIY projects around the house. This safe is just a steel box. It is neither fireproof nor waterproof. The instructions manual could be better. Even though it offers enough details to go through with the installation, the manual doesn’t state the default safe combination, and it doesn’t explain all the safe’s functions. This electronic wall safe is slim and easy to conceal. The safe’s compact size makes it perfect for your office, home, or vacation cabin. The safe is slim enough to fit inside a closet or behind a large painting. 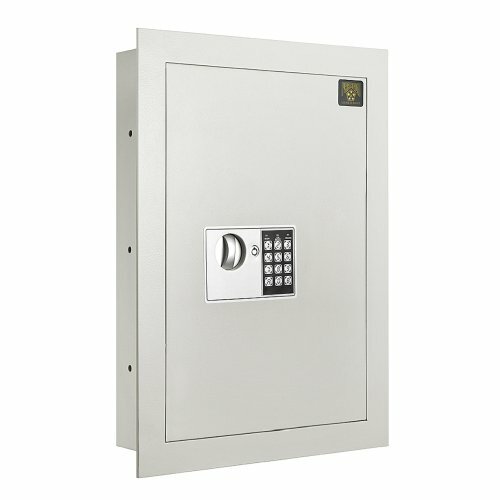 This safe is constructed using solid steel, so it will resist hand and tool attacks. The safe comes with pre-drilled holes that will allow you to fit it into position easier. The safe comes with a 10-year manufacturer warranty. The extended warranty is proof of the manufacturer’s trust in the product. This model comes with pre-drilled holes and fixing bolts, so you can install it yourself. The safe uses a grey carpet mat to protect your jewelry and handguns from scratches. Both the safe’s interior and exterior are powder coated against rust. The safe doesn’t come with installations instructions. The instructions manual only explains how to set the PIN code, and it explains some firearm guidelines. The safe doesn’t provide a template for cutting. The safe’s interior carpet is rather thin, so you might be better off placing another layer of carpet if you’re worried your handguns will scratch. This safe has a biometric (fingerprint) reader. It will recognize up to 120 different fingerprints. In case of an emergency, the safe comes with two override keys. The batteries should last up to two years depending on how much you access the safe. The safe comes with a one-year limited warranty. Easier to program multiple fingerprints, unlike other biometric safes. The safe is a small wall safe making it easier to hide than the larger alternatives. The battery compartment is external so it easy to change the batteries in the event they die. You do not have to have the key in order to change the batteries. The safe has pre-drilled holes so you can anchor it down. This will prevent an intruder from snatching the safe out of the wall. The safe is not fireproof, and it is only waterproof if it is elevated a few feet off the floor. The battery compartment is made of thin plastic making it easy to break. The interior shelves are weak so they cannot hold much weight. The fingerprint reader is sensitive, so you have to place your finger on the reader correctly for the safe to open. It is a small wall safe. It looks more like an electrical box than it does a safe. The shelves and the bottom of the cabinet are lined with foam padding to prevent your valuables from getting scratched. The shelves are made of steel, so you do not have to worry about them collapsing. The shelves are also removable. The safe comes with a three-year limited warranty, which covers workmanship and defects in the material. The design makes it easier to place inside the wall than other brands. The inside of the safe is lined with foam padding. The height of the shelves is adjustable. The locking mechanism is strong for the price. Installation is simple, and you can do it alone in very little time. The door does not have a handle. You have to leave the key in the lock and pull the door open. The padding does not stick like it should. You might experience the padding slipping when you place something inside the safe. The shelves are narrow, so you have a limited amount of room. This safe is not fireproof or waterproof. The safe will allow water, smoke, and fire to enter. 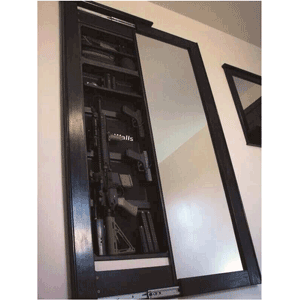 This steel wall safe is good if you are a gun owner that owns rifles and shotguns. It has a steel shelf that is good for small valuables. The shelf and the bottom of the safe are lined with foam padding so to prevent the contents from being scratched. The safe comes with a limited three-year warranty. The warranty covers workmanship and material defects. One of the biggest advantages of this safe and the advantage that most people look for is the price. This model is cheaper than most of the other brands that are on the market. The safe is designed to be flush with the wall making it easy to conceal. Comes equipped with two large shelves and a small shelf. The shelves are removable. Doesn’t take up floor space since it is a safe that you install in the wall. Floor safes usually need a good bit of room, and an intruder can easily see them. The safe can be installed high enough that children cannot attempt to gain entry. The lag bolts that come with the safe are simple Phillips head screws and are easy to strip. I recommend you purchase better lag bolts that are more solid and a higher quality. You cannot store long guns in the safe with all the shelves installed. You will have to remove all the shelves except the small one at the top in order to store shotguns or rifles inside the safe. The safe is made of light wright an intruder with a little time can gain entry to the safe with a pry bar. There aren’t any holes pre-drilled in the bottom of the safe in order for you to secure the safe inside the wall at the bottom or top. 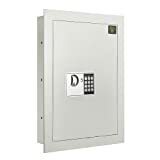 This in-wall gun safe has many features that others on the market in this price range do not have. It is equipped with a biometric fingerprint reader locking system. You can program up to 120 different fingerprints. I recommend you program a few fingers of each person you allow to enter the safe. There’s a compartment inside that locks also so you can lock the most precious valuables in a compartment alone. To compare this safe’s features with others in its class, check out our list of best biometric gun safes. Unlike many other wall safes, this safe is equipped with an interior light making it easy to retrieve the contents in the dark. 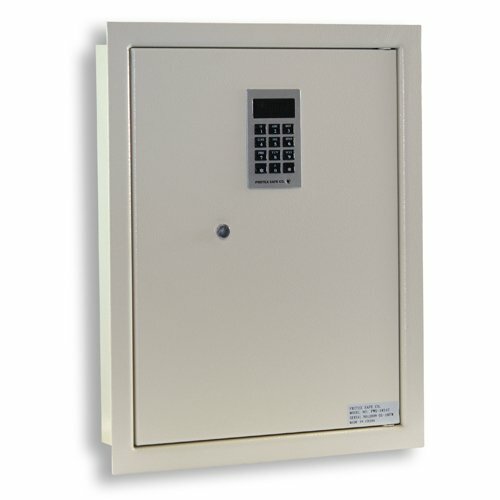 This safe has a unique feature that not many in-wall safes are provided with. It is equipped with a foldout tray that is perfect to use as a small table while you are looking at the safe. The inside of the safe is small. You can only store handguns and small valuables inside. The safe is made of thin metal that will allow an intruder to gain entry to the safe if they have a little time and a pry bar. There is a huge uprise of crime anywhere in the world and your house may not be totally safe anymore. That is why having a gun nowadays is already a necessity to some homeowners. However, owning a gun to protect your loved ones must be kept safeguarded in order from you to keep them in harm’s way. A safe is needed to keep people from accessing it without your permission especially kids, and sometimes being discreet that you have a gun is the best way to protect yourself and your family. Owning a gun is a huge responsibility and negligence are not an option especially if you have kids running around the house. By owning it will make your home a much safer place for your loved ones. If you are interested in owning an under bed gun safe check under bed gun safes. The best feature is that you can hide it completely. You can hire a decorator to make it look like its part of your wall and no one will notice that it there. Not all safes are the same, so you need to pick carefully on which one it is that you need. For instance, some biometric safes can only allow 5 people to gain access to while others go beyond 10 depending on the model. Budget is also something that you need to consider because for example, you would like the biometric kind of safe because you want to gain access to your gun safe easily, you must always remember that it has fingerprint scanners that make it quite expensive compared to regular ones. When you decide that you would rather have an in-wall gun safe, you have a few things to do in order to install the safe. Make sure you are sure of the location because it is expensive to move an in-wall safe if you decide you want it in a different location. First of all, you want to decide what part of the house you will be installing the safe. Whether you choose to put the safe in a room or a basement, it should be hidden behind a wall so people will not realize there is a safe there. Many people put it in the basement since a burglar, and the kids would not go into the basement being curious. After you find the spot, you want to install the safe you have to get all the measurements. Measure the safe to ensure that it will fit in the spot you have chosen. You have to avoid hitting any beams or struts. After you have all the correct measurements, and you are sure you will not hit any core structures of the house; you have to cut a hole in the wall big enough for the safe to fit. After you have the spot for the safe prepped, place it inside the hole and cement around the safe to make a stronger foundation. Once the safe is installed, you should step away from its look at how it looks as it is. Your safe should not stand out in the event an intruder enters your home. You might be thinking that nobody will ever find your safe since it blends in with its surroundings, or it is hidden well enough that nobody will find it. You can never be too safe when it comes to your valuables and guns. I recommend that you have an alarm installed around the safe. In the event that someone does try to enter the safe the sound of the alarm will stop them. 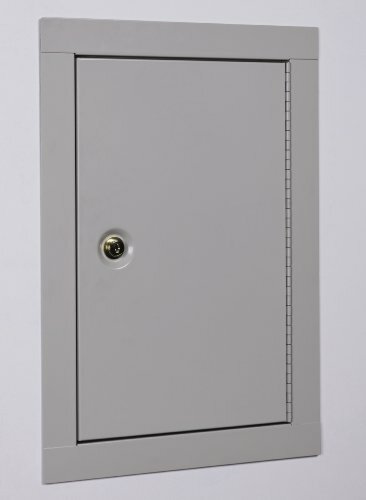 An in-wall safe is a great investment for anyone, but you should keep in your mind that most of them are made of thin metals making them easier for an intruder to gain access. Many of these safes are not really useful for storing long guns. In-wall wall gun safes are great for keeping children from getting their hands on your valuables or handguns. 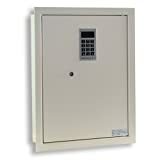 I would recommend you get a wall safe for storing anything valuable since they are easier to hide than other safes. You should also be aware that wall safes are not fireproof or waterproof. 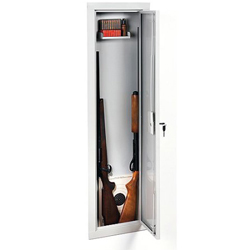 Check out our best gun safe reviews article at www.shootingandsafety.com/best-gun-safe-reviews if you specifically require one. Anything inside can be damaged in the event of a flood or fire. 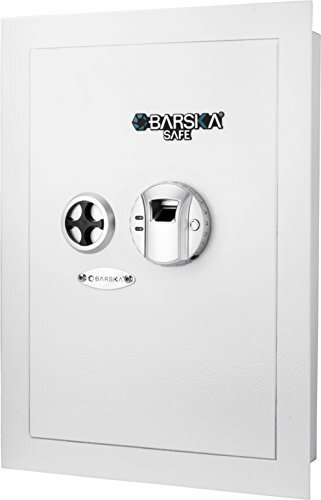 Comparing the good and the bad, I can honestly say that these are great safes for the price if you are looking for an inconspicuous safe. I’m interested in a wall safe that looks like the sliding mirror in your article intro but you don’t show any information on it. I’m looking for Morrow wall mount gun safe with width from outside to outside of 18 inches. Custom white finish ….